This entry was posted in Alpine Climbing, Hard Things, People and tagged inspiration, mortality, purpose on October 10, 2017 by sticker1. I couldn’t help but think about how a nerdy kid from the Chicago suburbs ended up swimming in the bottom of a cravasse in the middle of the Alaska range. When I was 17, I grabbed two high school friends and stole my mom’s minivan. I don’t really remember what inspired us then, but we drove west in search of adventure. We ended up spending two weeks exploring the Wind River mountains in Wyoming, and when I drove back to Chicago my heart was ready to burst out of my chest- all I wanted to do was learn how to be in the mountains. In thinking about telling this story tonight, I looked up the definition of inspiration- it is ‘that which compels us to take action.’ I was inspired, that is to say compelled, to be in the mountains. So I went home to Chicago, and every chance I got, I traveled west to be in the mountains. Eventually, I had the chance to move to Oregon, and I explored the mountains there. A few years later, I left my salaried job with benefits and moved into the back of my car so I could be in the mountains. From Scotland to Alaska to Ecuador, and all over the American west, I made friends and mentors and learned how to push my body in all kinds of mountain adventures. 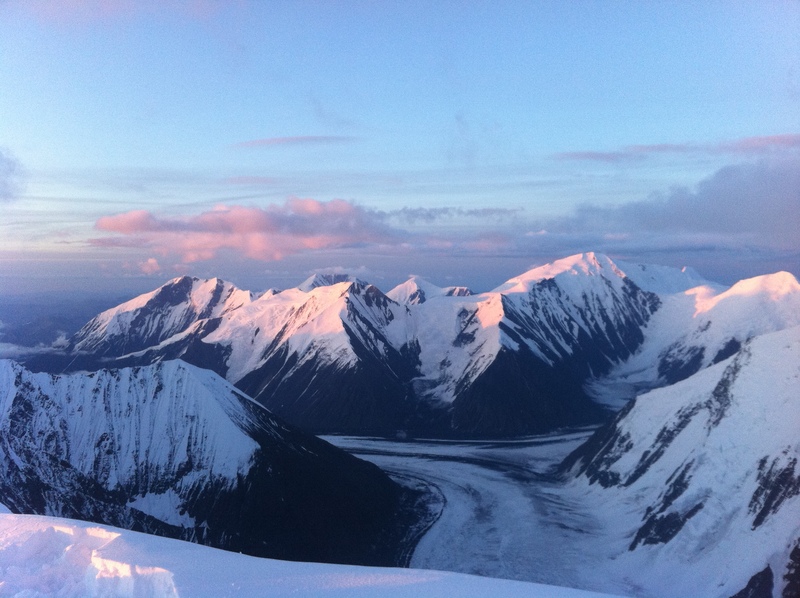 I gained skills and experience, and eventually, I was invited to work as a volunteer ranger in Alaska. I didn’t really know until a few years ago exactly why I loved being in the mountains so much, why I enjoy challenging myself, scaring myself, pushing myself to the very limit. I’ve been so fortunate to share my mountain adventures with a wide range of incredible adventure partners. Usually in climbing, and in the adventures I like to pursue, you need a partner. The mountain environments demand our complete attention- they make us face our securities, and then strip away the opportunity to entertain them any further. And I’ve noticed, when my partners and I stop entertaining our insecurities, it makes room for us to do incredible things. To transcend the limits that we’ve placed on ourselves. Getting to be a part of a partnership dedicated to transcending our limits- watching and supporting one of my partners stare up at something that they think they cannot do, but that they try anyway, and then succeed at- is the most inspiring thing I’ve ever been fortunate to witness. And so me and all my “skills” and “experience” were swimming in the bottom of this cravasse. I knew I had to step up to do what I could to help the situation, and I knew my partners above were doing their very best- one guy was making sure no one else fell in, one guy was getting warm clothes ready for me, and another guy was getting another rope to me. Eventually- humble, sopping wet, cold, and scared, I belly flopped back onto the surface of the glacier. I was not dead. My partners were so warm, so supportive, so caring- so ready to do whatever it was that needed doing to take care of me. I got back to camp quickly, got warm, and took stock of the lessons learned. So I keep going out, breaking my body, failing at all kinds of things, getting scared- because it strips away the insecurities, the baggage. That’s what I’m looking for, something to strip it all away, and I kinda hope that I never find it- that last thing to really take it all away, because the search is what keeps me inspired. Mt Brooks and the Pyramid Peaks from 12,500′ on Karsten’s Ridge, Denali. This entry was posted in Alpine Climbing, Missoula, Montana Experience, Philosophy, Traveling and tagged Alaska, cravasse rescue, cravasses, inspiration, Karsten's ridge, mountaineering, Muldrow glacier, National Park Service, partnership, teammates, trust on August 27, 2012 by sticker1.